You are about to find out why: Apple Cider Vinegar is one of the most powerful health and beauty remedies in the world! *GET THIS AMAZON BEST SELLER TODAY* With revised and updated content. Discover why Apple Cider Vinegar has been called The Miracle Health Elixir. There is a reason Apple Cider Vinegar has been passed down throughout generations as a safe, natural, and holistic health and beauty remedy. The award winning book Apple Cider Vinegar Benefits - 28 Secret Remedies, Detox Recipes, and Health and Beauty Benefits for Apple Cider Vinegar by best selling author and blogger Aubrey Azzaro will educate and entertain you on the amazing health benefits of Apple Cider Vinegar. * Lose Stubborn Body Fat? * Clear up your Acne or skin condition? * Get a sparkling white smile naturally? * Soothe your up set stomach? Apple Cider Vinegar benefits everyone. This book will show you how to do that and so much more. The benefits of Apple Cider Vinegar are in the hundreds. This book will show you the most common and effective remedies to maximize your results. My goal is to get *YOU* healthy and one of the fastest ways is to show you the benefits of ACV. This book contains 28 tips that are equally split between health and beauty. If you still reading - congratulations! You are one of the smart ones ready to take action towards building a better you. Get started today and learn how to use ACV to your benefit! Scroll up and click the buy button to instantly download Apple Cider Vinegar Benefits - 28 Secret Remedies, Detox Recipes, and Health and Beauty Benefits for Apple Cider Vinegar. This is a good book. The author gives lots of reasons why an individual should incorporate ACV into their lifestyle. I just wish they gave exact directions of how much ACV or any other ingredient should be mixed together. I also recommend researching more about using the ACV as a mouthwash and using it along with baking soda for the hair. Other than that, the book was good. 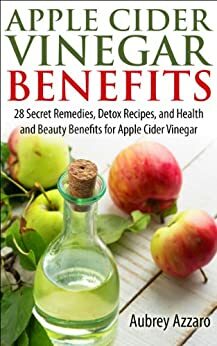 I was aware of apple cider vinegar and its benefits, but this book revealed so many other uses. In past I've used it for weight loss (very effective) and stomach relief (very effective) but I had no idea regarding tooth whitening, foot pain, and sunburn relief. You will find this book to be concise and quick to point on almost 30 proven benefits and I am sure their will be several that you never even thought of. Very comprehensive read and I do recommend this book. However, if you are looking for more benefits of the Apple cider vinegar, you will have to invest in something with a little more substance. There was one part in the book in which it talked about taking ACV every day to boost the immune system, but it didn't explain how much you should use or if you might mix with water or something else to make the taste more palatable. Otherwise it was great for a start, but if you are seriously considering including ACV in your regimen, I would look further. I love reading books about natural remedies, and "Apple Cider Vinegar Benefits" was full of them! I was completely unaware that ACV has such a broad range of uses, such as a hair rinse, a deodorant, a detox option, and a skin elixir to get rid of acne or age spots. I also liked when author Aubrey Azzaro provided step-by-step directions on how to make your own ACV. Definitely a must-read for anyone who is concerned about his / her health and interested in natural remedies. Now I know what to do with that Apple cider vinegar that has been in my cupboard unused for over a year. I had no idea of the many health benefits as well as other uses.